On July 16, 1913, the Brewers welcomed the Columbus Senators to Athletic Park for a meeting between the top two clubs in the American Association. The Brews were tearing up the Association with a record of 56-36, but the Senators were right on their heels in second place. Joe Hovlik started on the mound for the Brewers, but struggled right out of the gate. He walked the first Senator he faced, then gave up a long sacrifice fly and a pair of long singles and with them a run. Sharp fielding from his infield kept the damage from being worse, and the Brewers were only down 1-0 when they came up to bat. The Brewer batters spotted him two runs in the bottom of the first, but Hovlik gave Columbus back the lead in the third inning when third baseman/manager Pep Clark had seen enough and pulled him. Clark sent lefty Ralph Cutting in to throw. Cutting gave up a quick two-run homer but then settled down. The Brewers had a chance to go ahead in the fifth when Newt Randall led off with a single. Shortstop Russell "Lena" Blackburne followed with a single to center, leaving Randall on second. The Columbus first baseman, Ray Miller, bobbled the next grounder, and Randall made a wide turn at third before heading back to the bag. Blackburne, seeing his teammate break for home, kept running and when the ball arrived at third both Brewers were standing there waiting for it. This rare baserunning error cost the Brews dearly, as they then loaded the bases before Clark lined out to end the inning. In the sixth, the Brewers managed to plate a run, cutting the Senators' lead to two. Cutting was pulled for a pinch-hitter, and Buster Braun was sent out to pitch in the seventh. 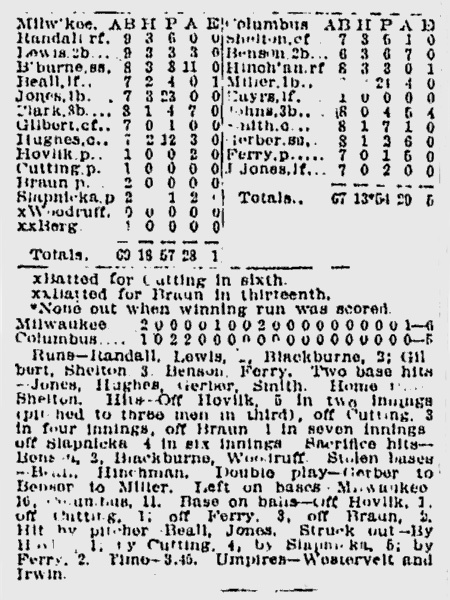 Throughout all these Milwaukee pitching changes, Columbus starter Jack Ferry stayed in the game, pitching himself out of every jam as the Brewer bats continued to come up short. Ferry had "a big, sweeping curve and a beautiful drop," and he used them both to his advantage. The Brewers were still down 5-3 as they came up to bat in the bottom of the ninth. Three outs left to salvage a victory. Randall popped out to lead off, but second baseman Phil Lewis scratched out an infield hit. Next up was Blackburne, who sent a shot into right. Lewis moved to third and scored when Miller again bobbled the throw in from right. The Brewers were back in the game. That brought up Tom Jones. 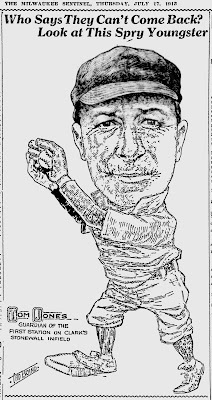 The 36-year-old first baseman had played in the American League from 1904 through 1910, first for the Browns and then in Detroit, before Brewer owner Charles Havenor convinced the Tigers to part with him in 1911. 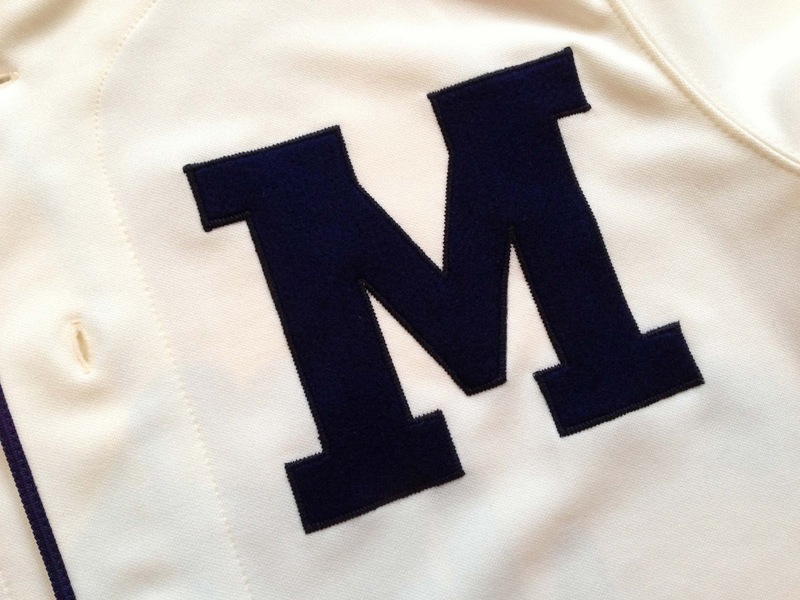 As a veteran, Jones was a leader in the clubhouse and on the field, and had assumed managerial duties on a few occasions when the skipper was sick or scouting talent. Jones slapped a weak grounder to third but managed to beat the throw to first, scoring Blackburne and sending the game into extra innings. The Brews managed to hold the Sens scoreless in the top of the tenth, but put up their own goose egg in the bottom half. And so it went through the eleventh inning. 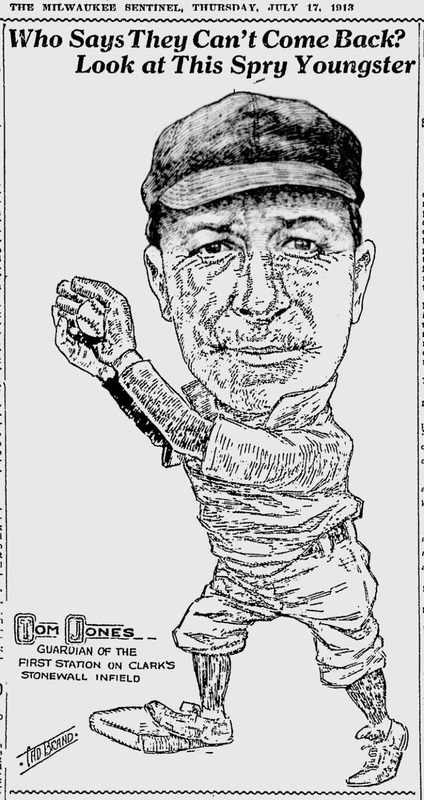 In the twelfth, the home fans thought the game might be over when Tom Jones lined a drive all the way to the scoreboard in Athletic Park's deep center field. Unfortunately for the Athletic Park faithful, the big slugger got greedy, and was cut down at third trying to stretch his solid double into a triple. Clark pulled Braun in the fourteenth inning so Joe Berg could bat for him, but the Brewers failed to score and had to take the field again, this time with Cy Slapnicka on the mound. Slapnicka picked up right where Braun left off, "pitch(ing) rings around the enemy". The Senators kept going down in order; the Brewer pitchers had found their rhythm now. Unfortunately, so had Ferry. The Columbus starter was still in the game, and still managed to pitch his way out of trouble. The nineteenth inning started out just as the previous nine had, with the Columbus batters retired and the tie holding fast. But in the bottom, the Brews were finally able to break through with a marvelous example of what we would now call "small ball." The rally began with a "smoking drive to center" off the bat of Blackburne. Following him up to bat was John Beall. 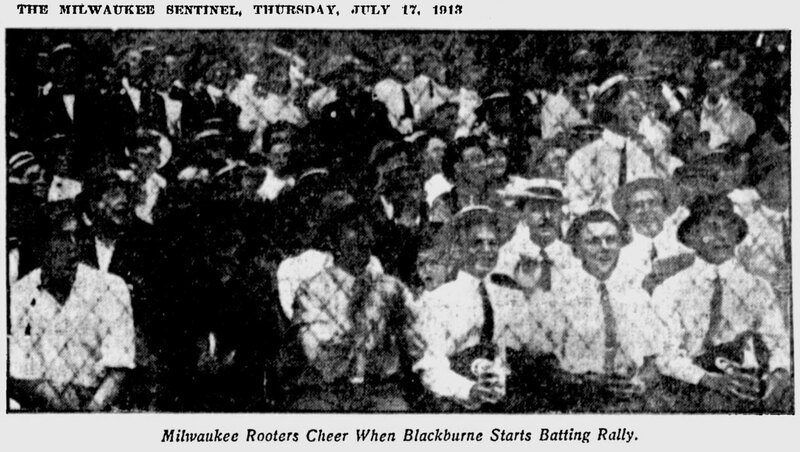 The centerfielder had been purchased from the Cleveland Indians just a few weeks earlier to bring more power to the Brewers' lineup, and he came through with a smash to right, sending Blackburne to third. Now with men on the corners and nobody out, Tom Jones strode once again to the plate. This time, Clark had something more creative up his sleeve. He called for a squeeze play, Jones laid down a perfect bunt up the first base line, and by the time the Columbus first baseman even got his glove near the ball Blackburne had crossed the plate to end the game. (Ferry's) work was so finished and polished that it was too bad he couldn't grab the glory. The youthful right hander had almost uncanny control, for he (walked) but two men during the nineteen chapters of play. He was also at his best when danger threatened and time and again he pitched himself out of hot water without batting an eyelash. More power to him! At 6 o'clock the Journal building was the meeting place of a crowd of men waiting eagerly for the papers to roll off the press. When they were finally informed that the Brewers had won out, a loud cheer went up.